As many of my friends and followers know, I am a huge Lost fan. I read the blogs, take the online polls about which character had the best line in an episode, post theories on Dark UFO’s Lost blog, and generally annoy people on a weekly basis about the show’s greatness. My rants are usually reserved for those who don’t watch the show—inconceivable and blasphemous! Get with the game people! Ever since the producers of the show announced the scheduled ending of the show over two years ago, I knew that I would be both excited for the culmination of the show’s confusing 6 year run and saddened by the void the show’s absence would most certainly leave in my life. The show ended with a two and a half hour event two weeks ago with sheer brilliance, emotion and perfection. I could hardly believe my eyes. I knew I would never see something like that again and I knew that I shared that event with thousands of other fans who lived and breathed this show for the past 6 years. What, if anything, could fill this void? Enter the Summer of Strasburg. The comparisons are humorous if not 100% accurate or relevant. Both the Lost finale and Strasburg’s debut were strikingly similar. A two and a half hour event which consumed the audience with sheer brilliance, emotion and perfection. The culmination of several years of confusion, identity seeking, and wonder. Would it live up to the hype? Could it possibly be what we were all waiting for? Would it answer our questions? In both cases, yes appears to be the only answer I am capable of concocting. For thousands of Washingtonians and people across the country, Strasburg’s debut was the event we’ve all been waiting for. What hasn’t been written about this night? Well, perhaps a comparison between the Lost finale and Strasburg’s debut. 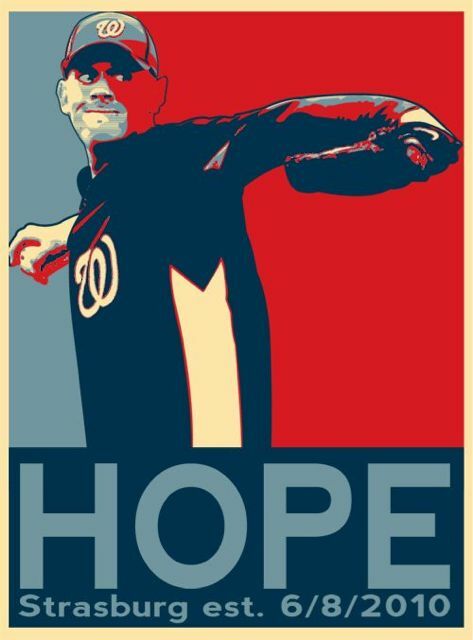 Devoted fans of Lost and the Nats have been waiting for something for several years, on the edge of their patient seat. And in both cases, each delivered. And in both cases, someone was probably annoyed by my rave reviews. It is ironic that the main point of Lost was that everything begins and ends, life is a cycle and hope is what brings us together. As Lost ended two weeks ago, a 21 year old kid was on his way up to fill the void in my life, throwing 100 mph hope. The almost eerie timing of the overlap is what gave me the idea of writing this piece. One door closes and another opens. I have been so wrapped up in Strasburgmania over the past few weeks that I didn’t even blink when Lost was not on the tv schedule the past two Tuesdays. But you know what was on TV this Tuesday? You got it. The Lost finale was a 14 strikeout night. Strasburg was the true protector of the island, “he who will save us all.” Fitting that his nickname is Jeezus. Both events were the culmination of all the questions we’ve been asking for years…they were a realization of hope. Although both were over in a blink, they both will live in my mind for years to come. In the end, Strasburg has a leg up on Lost for one reason: While Lost captivated my mind and soul for 6 seasons, it only came on once a week. Strasburg will captivate a nation every 5 days for the next 6 Summers of Strasburg in Washington. The only question is…what am I going to do between November and February? Oh, right. As many of you may know…I’m also a rabid Duke basketball fan. I suppose the circle is complete. Stephen “I will make you look silly” Strasburg just dominated another game in AA. The Reading Phillies featured a group of guys with amazing baseball names including: Chance Chapman, Tuffy Gosewisch, Tagg Bozied, and Ozzie Chavez. What they made up for in names, they lacked in the batter’s box. Strasburg allowed just one hit (a single) in 5 innings this morning. Final line 5 ip, 1 hit, 6 k’s 1 walk. no runs…unofficially, 67 pitches/48 strikes and leaves the game with the Senators winning 1-0. His ERA is now 0.73. His record is 2-0. 12.1 IP, 1 ER, 7 H, 3 BB, 17 K, 2 wins-0 losses, 0.73 ERA. The obvious question is: how long can Strasburg stay in AA, or in the minors? Is he even being challenged? The word around Harrisburg today was Strasburg could do pretty much anything he wanted on the mound. He made AA hitters look silly. He lowered confidence levels, he made guys’ knees buckle, he made people smirk in disbelief. His fastball peaked at 98 and never went below 95. I remember when Ben MacDonald dominated the minor leagues. He also dominated the major leagues for his first 5 starts. Things went sour when he faced some challenges and lost confidence. Strasburg’s next outing is on Monday, April 26 in Reading. After that, even Rizzo doesn’t know. It’s possible Strasburg will make his way to Syracuse en route to Washington, D.C. Experts and analysts predict a June 4-7th debut against the Cincinnati Reds at home. Can Strasburg be contained for that long? Should he be? What happens if the Nats stay at .500 for a few more weeks? 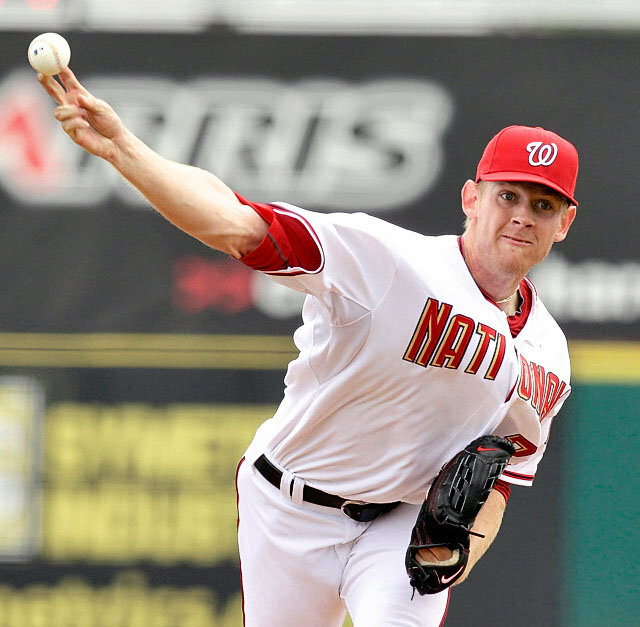 Will Strasburg solve a major piece of the starting rotation puzzle? Regardless of what happens in the next few months, Strasburg has excited the baseball world. I cannot wait to see this kid pitch on the big stage. I have a feeling he’s chomping at the bit. I have a feeling we’re about to see something special. After his next start, where should Strasburg go? This year I have become more interested in baseball than in past years. I have a fantasy team, a Facebook NatsWorld fan page, I keep up with my Twitter account following mostly baseball news, I have the MLB Gameday for iPhone, as well as an MLB subscription (thanks to my brother!). My wife even yells at me for having the game on the TV, MLB audio on my iPhone and a chat room open, simultaneously. While these avenues collectively have changed my baseball watching experience, the biggest surprise this year has been my participation in the world of chat room. Initially, I found MASN’s Ben Goessling’s In Game Thread as a way to keep track of Stephen Strasburg’s games since some were not televised. But after a few games I really got hooked. Ben is very accessible, even emailing with Nats fans and asking their opinions on how to improve the fans’ experience throughout the season. He welcomes everyone and is extremely patient with the newcomers who tend to ask the same questions over and over again. Even better, Ben has something all baseball fans would love to have: access to the players, managers and owners for interviews! Since most of us are not fortunate enough to have full-time baseball gigs, the chat room is the next best thing, allowing fans open access to Ben’s experience working for MASN, his deep knowledge of baseball and the ins and outs of the Nationals in general. Got a question? Ben has the answer, or at least the resources to find the answer. Want to vent? The chat room welcomes all opinions. Are you a Phillies fan who lives in DC (chances are pretty good that you might be)? Then the chat room is even the place for you. The “regulars” of the chat room are from various places, have various jobs, but are all sincere Nats fans. The depth of discussion ranges from which uniforms we like best to which player has the best BA on day games since 2008 and everything in between. Several of the folks in the chat room have become Facebook friends who follow one another’s blogs, and Ben even set up a few meet and greets at Nationals Park before the games. After a long day of work, there is something familiar and refreshing about signing into the chat room, seeing familiar user names, and talking about baseball for a few hours. So the next time you hear about the Nats fan base being sub-par, just remember that there are rabid fans out there, our number is growing, and we now have a place to congregate.